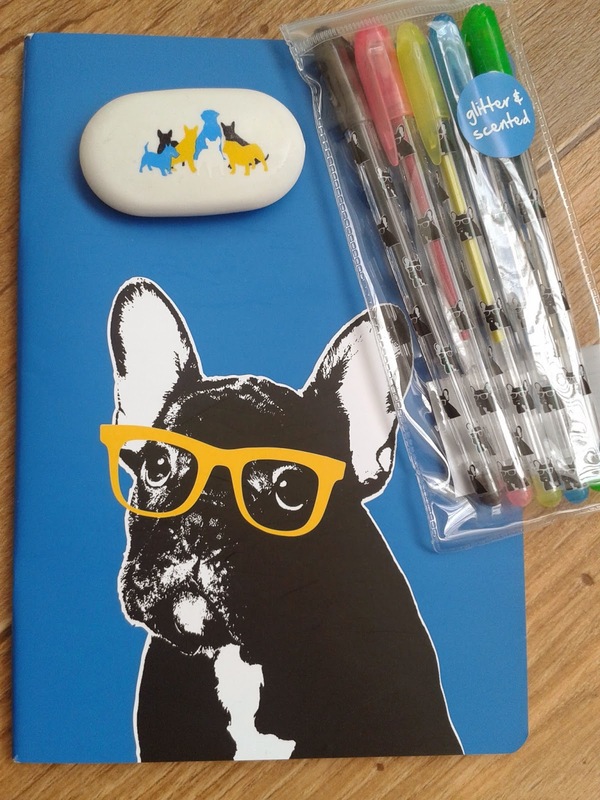 As it's almost time to go back to school I'm giving away two Deluxe School Packs, not that I feel we ever need a reason for some new stationery! I have a My Little Pony set and an I Love Zombies set. Both sets include a pencil case, pencil, pen, pencil sharpener, eraser and a 15cm ruler. 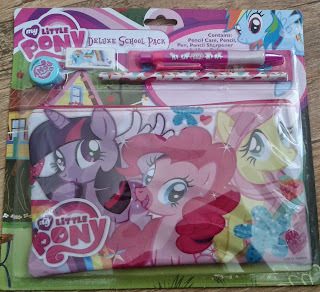 If you would like to win one of these sets all you need to do is enter via the rafflecopter below. I will try and send the winners their first choice but should both winners choose the same they will be sent out randomly. If you can't wait to find out if you have won they can be purchased over here for the My Little Pony and here for the Zombies. We're half way through the summer holidays and for once in my life I'm feeling organised. This year I won't have to go to 10 different shops to find plimsolls that fit or send my son to school without a jumper because the uniform shop has sold out, this year I'm on it and I'm nearly finished. 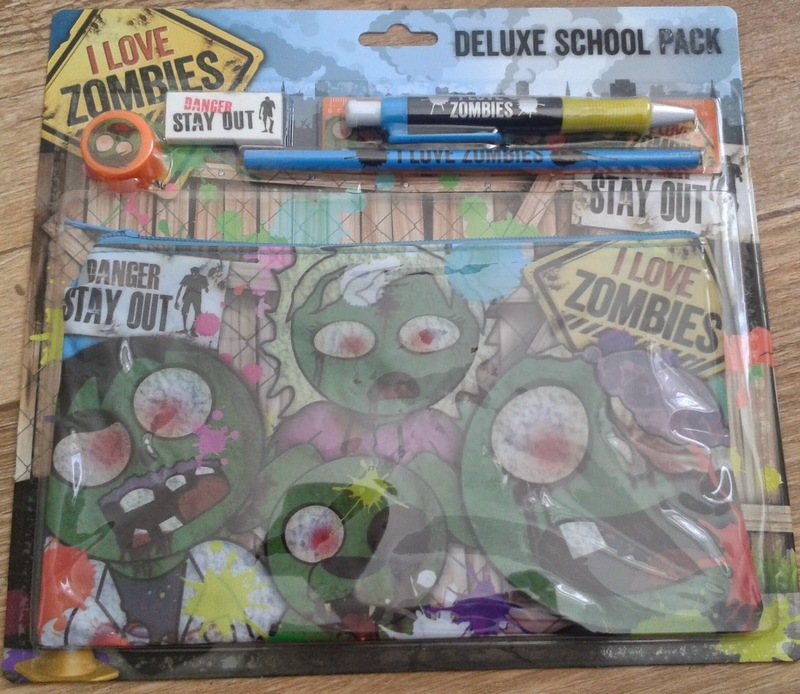 This is my sons first year at secondary school and in the never ending list of things to buy is stationery. Now that's one thing I have no problem at all shopping for. We bought pens, pencils, a maths set, notebooks and many other fabulous things that now have pride of place in my sons brand new pencil case but it will come as no surprise to anyone who is aware of my stationery love affair that this cute little set found its way into our stationery stash. These are part of the Wilko Dandy set. I'd love to know why it's called Dandy. For now I'll pretend the cool shade wearing dog is called Dandy. I could have gone all out and bought everything. There were matching notebooks, pens, pencils, a cup, folders and more. Choosing just three was a difficult task. I've noticed that sometimes when people buy an own brand pen their expectations are lower and if the pen has flaws it's somehow more acceptable because it's own brand. This used to be my way of thinking too but not anymore. I like to treat them all the same and if it's good it's good, if it's not it's not, regardless of the name on the packaging. The A5 80gsm notebook has 40 pages and I already had a couple of these with different designs so I knew when I bought it that I would love it. Most of the pens I own are compatible with the paper and it's a great size for my handbag and sit nicely on my bedside table without taking over. Whenever I'm asked if I think I should stop buying notebooks as I already have lots I ask them what good is my massive pen collection without paper to use them on? The eraser - no idea why I bought it. I have a pencil case full of them, most used only once or not all all. *Stands up* - My name is Janine and I'm a stationery addict. The pens are seriously cute. I was originally attracted to the repeat pattern of Dandy the dog looking cool as a cucumber but when I realised they were colourful glitter pens and scented, I was sold. They come in their very own clear plastic zippable wallet which really pleases me for some unknown reason. I've never used scented pens before. I knew they existed but they never interested me until Dandy helped me sniff them out. The packaging doesn't tell you what each scent is so I got to work sniffing the pens, smelling the paper, sniffing the pens again (then explaining to my concerned looking boyfriend that there was a perfectly good reason for the sniffing) and I can tell you I'm not 100% sure what some of them are supposed to smell of. The black ink keeps giving me the faintest hint of chocolate but the second I smell it it's gone again so whether it is indeed chocolate or just my wishful thinking remains to be seen. The blue pen is giving me no clue. I'm definitely getting a whiff of something but I just can't work out what. The yellow pen smells of bananas, the pink pen smells of strawberries and the green pen smells of apples. I was using the green pen for a diary entry and the apple aroma was quite strong once I'd filled the page but I must admit it became a little sickly after a while. Memories of apple shots and a night in the bathroom came flooding back. I've just experienced first hand how powerful a smell can be to triggering memories, even ones I'd rather forget. I'll keep my next diary entry short and sweet. The colours are bright and cheerful and a lovely break from my usual black and blue. I love to see colour in my notebooks. My eyes are immediately drawn to it and the whole page appears friendly and inviting. The glitter adds a certain sparkle to my awful doodles although in a much more subtle way than I expected. When I look at my writing head on the glitter in the ink is barely noticeable but hold it up to the light or look at it from an angle and prepare to be dazzled. The ink is slow to dry. About five seconds after completing my rainbow snake I wiped the side of my hand across the page and the result speaks for itself. This could mean messy business for left handers and possibly even impatient right handers. It's not so terrible if you are aware of it and prepared to give your masterpiece a little extra drying time. So they were the main selling points and my reason for buying the pens but what are they like as pens in general? 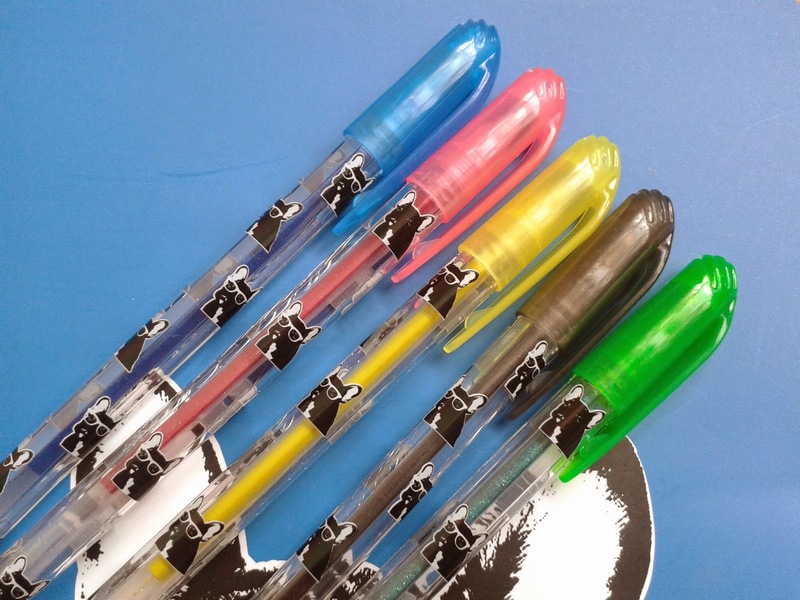 The pens are made of plastic, with no grip, similar to everyday ballpoints found in almost every home and workplace. They are not necessarily designed with comfort in mind, more for convenience and cost effectiveness. The lack of grip does mean I'm at risk of slipping after long periods of use but so far I have found the pens comfortable to use. Their light weight and thin bodies mean I can move across the page without any balance issues or aching hands. The ink flow on the whole is acceptable. Every so often the ink flow would stop completely as if the ink had run out but after a good shake and a scribble it would return to normal but for the most part the ink flow was continuous and smooth without any skipping. The thickness of the ink was probably causing it to get clogged up and that's why the shaking helped bring the flow back. The tip feels smooth against the paper with just the right amount of resistance to slow me down just a touch, enabling me to keep my handwriting in check. Like most ballpoint stick pens these glitter pens are not refillable so will eventually find their way into my retired pot. I definitely think these pens are worth checking out, especially for those young people who still appreciate the joys of pens and paper. The colours and glitter may not be suitable for the classroom but I wouldn't be surprised if they still found their way into pencil cases. Notes being passed round the classroom while the teachers back is turned still goes on in schools I'm sure and scented glitter pens will do the job nicely. Lets just hope the teacher doesn't have any apple related flash backs of their own or it will be game over and 100 lines at break time. 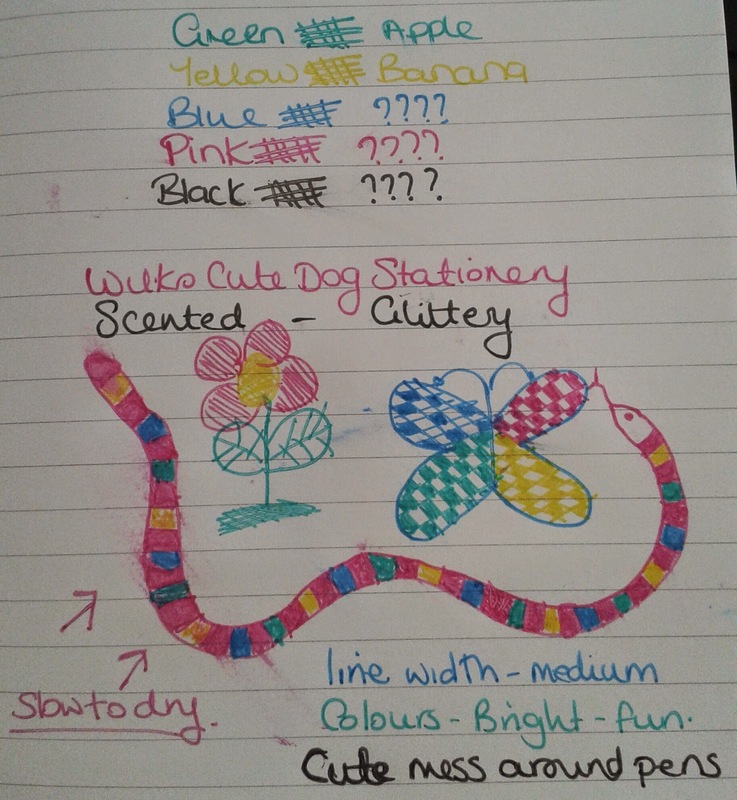 If like me, you need Dandy the dogs scented glitter pens in your life then you will find them over here. Being the pen addict that I am I like to keep my nose to the ground for any stationery related competitions that are occurring in the hope I might get lucky. 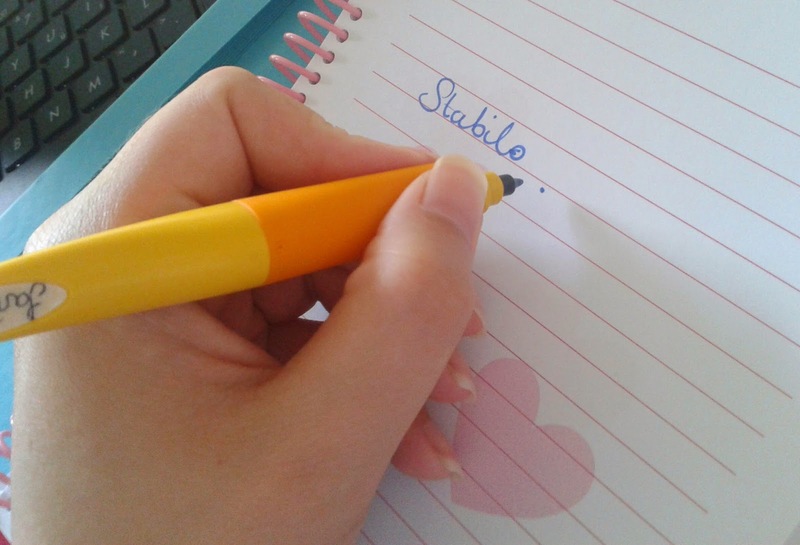 There is always room for more stationery in my life and I struck gold with Stabilos #WinItWednesday twitter competition. 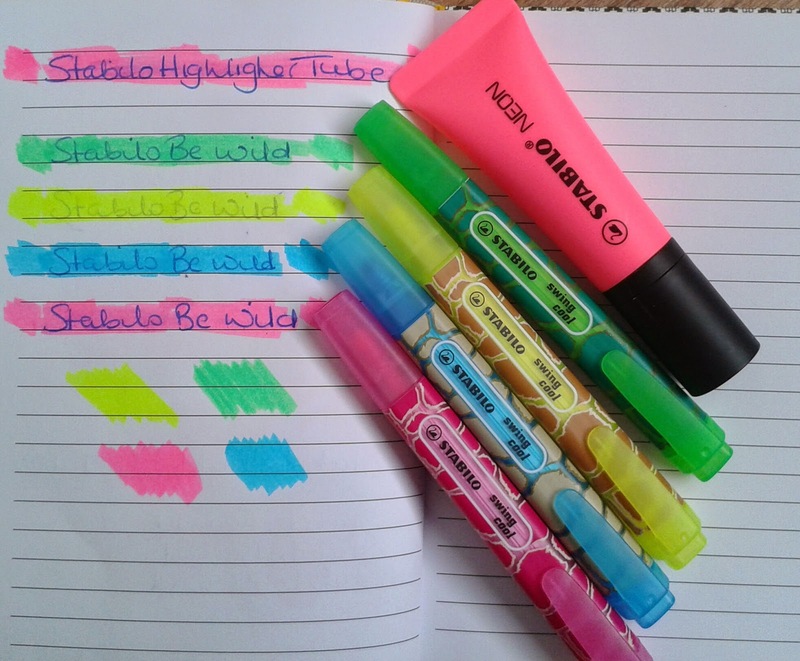 Both my friend and I won a Stabilo Easy Original Rollerball, a set of Be Wild highlighters, a highlighter in a tube and a set of Stabilo colouring pencils. Before I review the pen I just want to quickly talk about the others as they have made quite an impression. 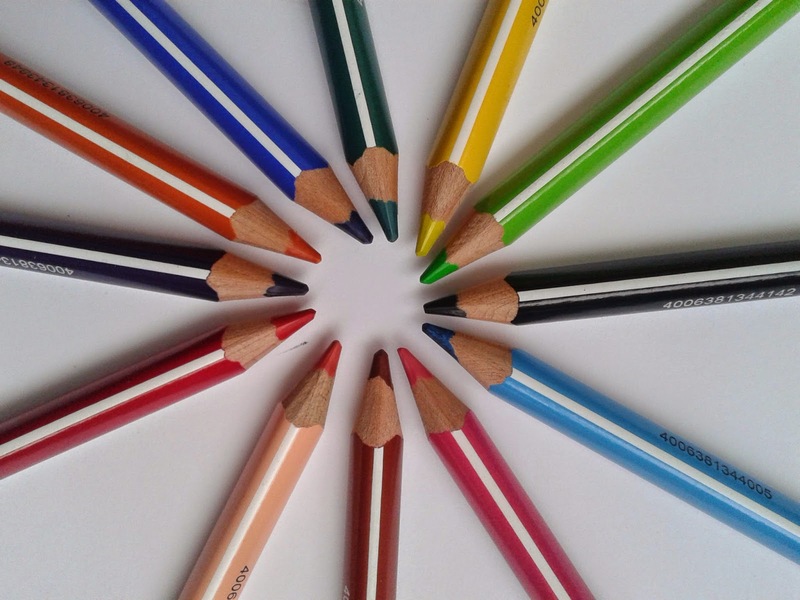 The colouring pencils are in a pack of 12 bright and cheerful colours and being thick pencils can cover quite a large area quickly. I had fun colouring in my random squiggles and my son who I think may be developing a mild stationery addiction of his own is now enjoying using them for his rap battle illustrations - Don't ask! The highlighters are not just any old highlighters. They are funky, proud to have in your pencil case, ready to whip out and show off at every possible opportunity highlighters. The Be Wild highlighters have a trendy animal print design which definitely stand out from the crowd. You would be forgiven for thinking the pink tube was paint. At first glance it's what both my son and I thought it was. I was obviously snoozing when these Neontastic babies were first revealed to mankind. Not to worry, they now have my full attention. The tube shaped highlighter is possibly a little awkward in terms of shape if you have limited pencil case space but for desk use - amazing. It stands up and is easy to spot and grab in seconds. 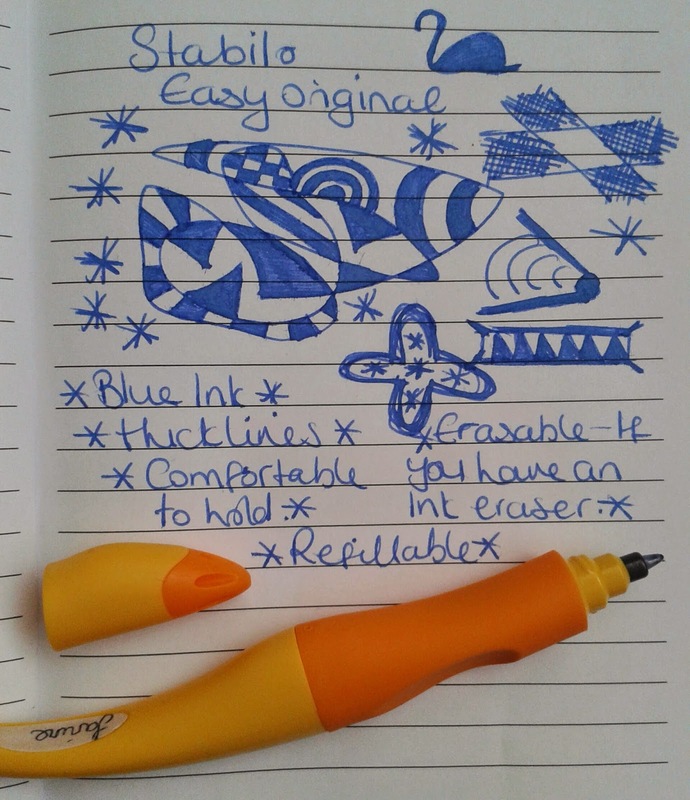 So now lets get to the pen, the Stabilo Easy Original right handed rollerball. Being a lefty I asked my right handed boyfriend to hold it so I could see the correct way to grip this pen and he looked at me as though I'd just asked him to find me some tartan paint. To start with he didn't believe such a pen existed. To him a pen is a pen and he saw absolutely no need for specific left or right handed pens. 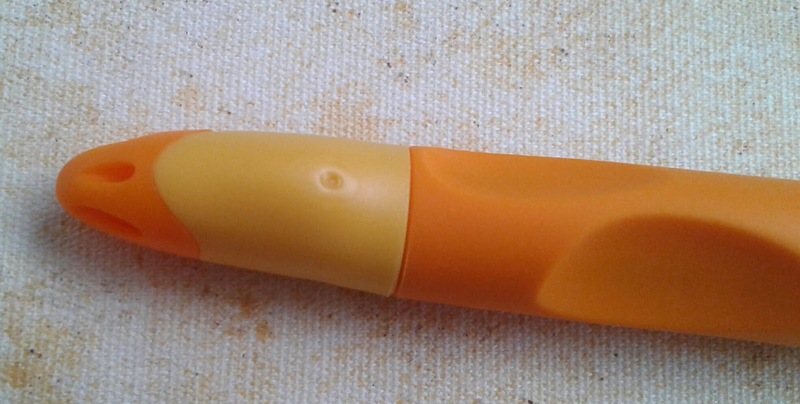 I'm on the fence with this one but I ought to bear in mind that these pens are designed for young children just starting out and the positioning of the dips in the grip are there to guide the children into using the correct grip right from the start. This means that the extra time they would have spent learning the correct or most comfortable way to hold a pen can now be spent concentrating on the writing they are producing. The curved tail end of the pen should rest nicely against the side of the hand which helps with balance and weight distribution making it a comfortable pen to hold for long periods of time. When I've looked at other pens which are used in schools, the Berol Handwriting pen for example, I liked the pen but the lack of a grip was an issue. So whether it's necessary to have specific left or right handed pens doesn't really matter, what matters is that these pens make learning to write easier and much more comfortable which can only be a good thing. My son is now 11 and has gained plenty of experience with holding and using a pen but I was still interested to see what his thoughts were. They way he positions his fingers are slightly different to how the grip says the pen should be held so he found it a little strange to start with. He didn't like the shape of the pen or the way the dips in the grip were positioned and wasn't really prepared to give it much of a chance which was disappointing. He didn't like the look of the pen so I think he'd already taken a dislike to it before even trying it. Had he been 6 maybe the pen would have appealed to him more. When I pointed out that the lid looks like a ducks head I did see the ghost of a smile and he did have a quick peek before retreating back to his room so my baby boy is still in there somewhere. I actually liked the grip. As a left hander I had my first finger in the dip closest to the tip and my thumb on the smooth side of the grip so the curved end of the pen ended up facing the wrong way but it made no difference to my writing experience. A right handed person could hold it in exactly the same way if they didn't like where the dips were positioned. The distance between the grip and the tip of the pen suited me nicely and the pen although bulky in appearance felt light and comfortable to hold and use. The first thing I noticed when I started writing was the line width. For a medium is feels quite thick. I'm more of a fine line girl but my eyes soon adjusted and it didn't seem so bad after all. The only trouble with thicker lines is that my handwriting gets bigger without me even realising I'm doing it. With smaller handwriting the thick lines appear even thicker so subconsciously I'm probably trying to making my lines appear thinner. I doubt line thickness would make any difference to the children this pen is designed for. Children who are learning to write usually have larger handwriting when they first start out so a thicker line width is probably ideal for them. I have been experiencing some skipping. When I join my letters up the pen writes beautifully but if I lift the pen from the paper, the first letter I write after can sometimes be a struggle. The ink just needs a second to start flowing smoothly again. It's nothing horrendous and doesn't spoil the appearance of my handwriting at all, it's just a minor irritation for me and not necessarily an issue with every Stabilo Easy. The tip of the pen reminded me a little of the Berol Handwriting pen. It looks similar but that's where the similarities end. 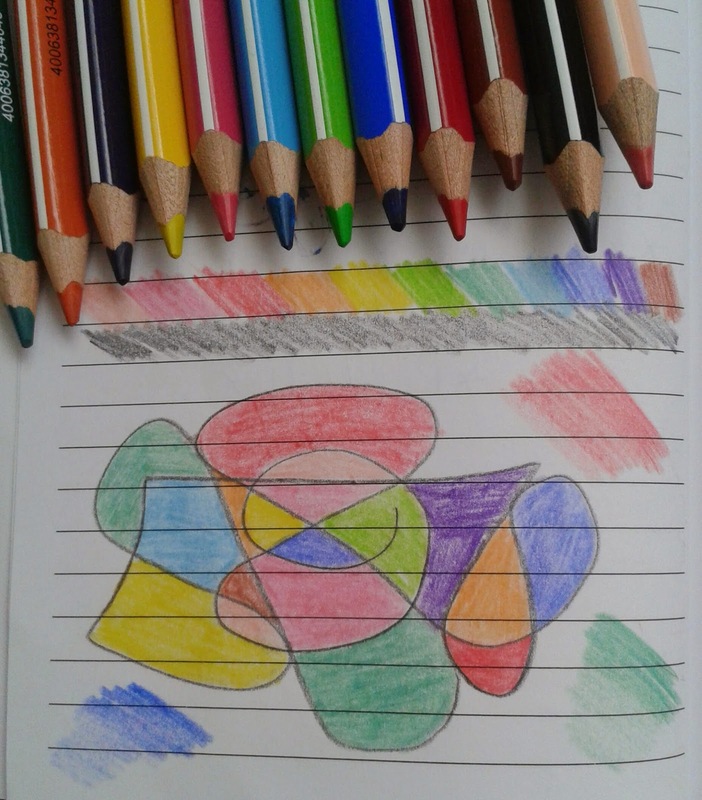 The Stabilo feels smoother and softer on paper. Every notebook I've written in with the pen has reacted favourably. The ink has been quick drying, there has been no feathering or bleeding though the page and it feels lovely. Almost spongy and absorbent, pen and paper melting into one another. I wouldn't have been surprised if one of my notebooks had snapped shut with the pen still inside so it could keep it all to itself. The ink is erasable too but I didn't have an ink eraser so I was unable to test how well it erases. I would have quite liked the pen to have an eraser built in somewhere or provided with the pen as I'm sure it's a feature that children would appreciate but ink erasers can be picked up quite cheaply in good stationery shops and perhaps I'm being a little greedy, especially considering the pen came with not one but three refills. I'm over the moon that this pen is refillable. This is a pen that a child will be using day in, day out so gone are the days of fighting around the pen pot for a pen that actually works. 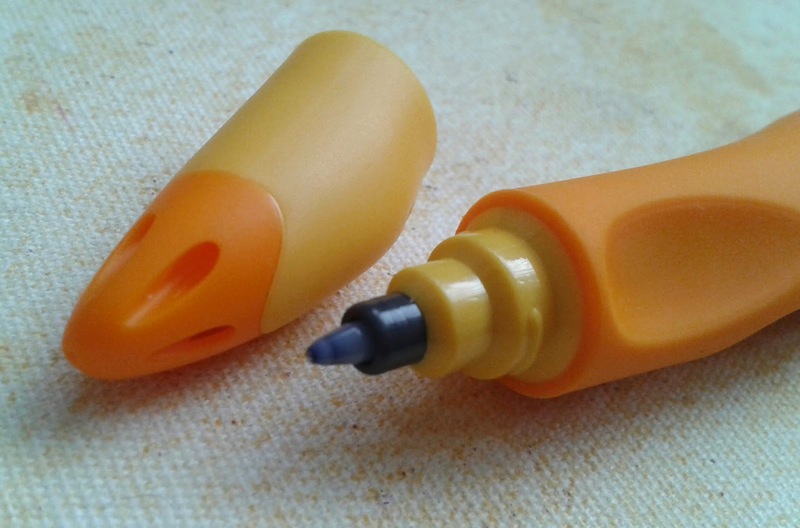 The pen unscrews at the end of the grip and the refill clicks into place. It's so easy. Another great feature of this pen is the ability to personalise it. Stabilo have not only made sure with the three refills that you will get plenty of use out of it before having to spend any more money, they have also provided each pen with 3 name labels. When it gets worn out or damaged it can be replaced. 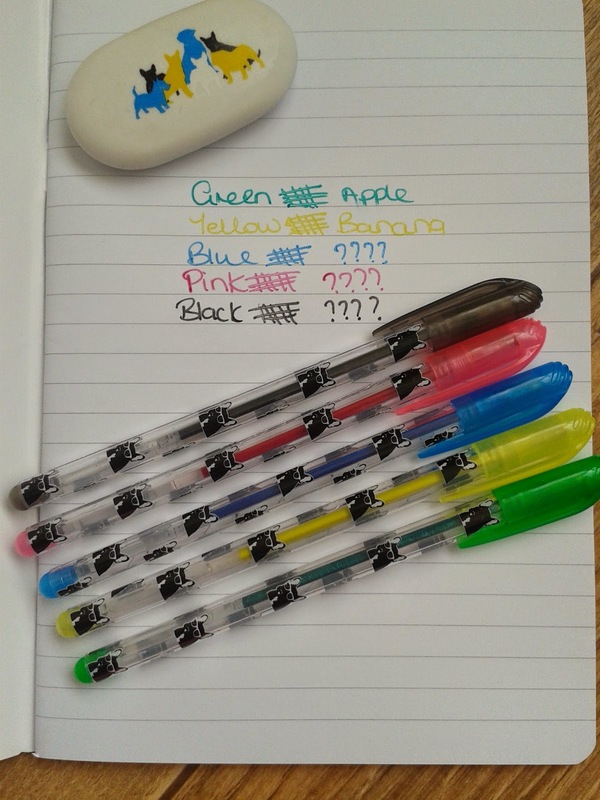 Not only does this help prevent classroom squabbling over who's pen belongs to whom, it helps teach the children to look after their own belongings. The pen doesn't have a clip but it's not something I think primary school children will be too bothered about. I did worry a little about the lid getting lost easily but I was surprised to find it does actually clip on quite snugly to the tail end of the pen should you wish to keep it safe. The lid is light and doesn't alter the balance of the pen when posted. The lid twists on and off easily. 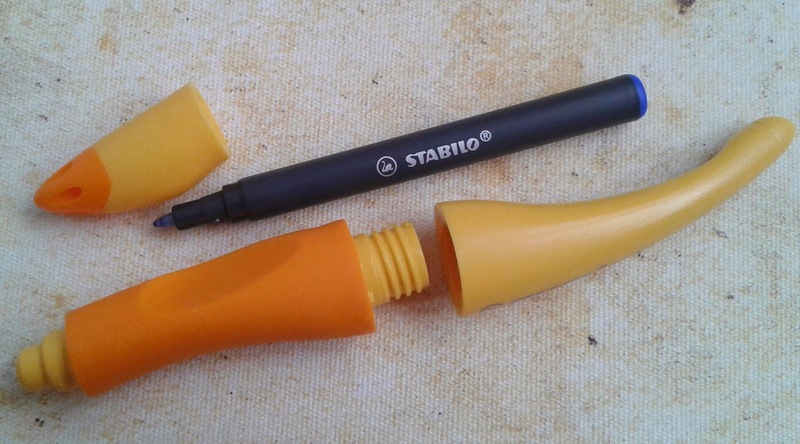 Stabilo have made this pen very easy to use so the name Stabilo Easy suits the pen perfectly. If I had a child in Primary school I would definitely be speaking to the teacher to see if we could swap the Berol for the Stabilo. The Berol is still a great pen but the Stabilo in my opinion is better. Summer holidays are here. For the most part I'm sure the children will be keeping themselves busy playing outside, having a blast on a family holiday or going on exciting day trips. There will however come a time when those dreaded words are spoken - "I'm bored, there's nothing to do" despite the toy cupboards crammed full of toys. 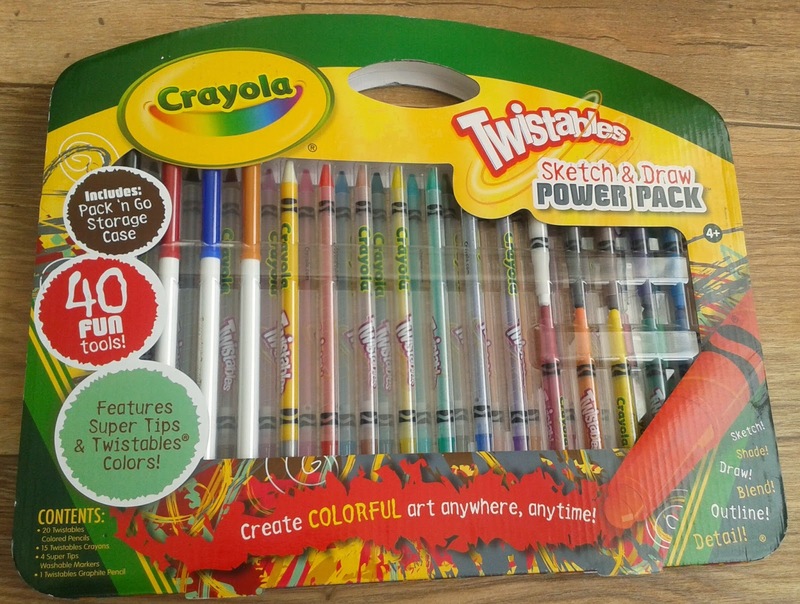 Fear not - the Crayola Twistable giveaway is here. 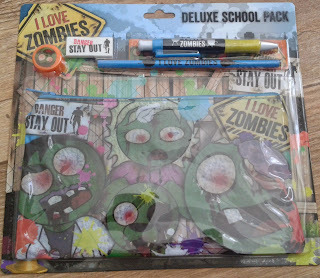 This amazing set which comes in a handy 'pack 'n go storage case' will help keep those creative minds creating. In order to enter this giveaway simply enter via the rafflecopter below. If you can't wait to see if you've won then you could always pop over here and buy it now. Open to UK residents only. Don't forget to leave me your name or a way of contacting you if commenting anonymously. This competition not sponsored by anyone and I have funded it myself.